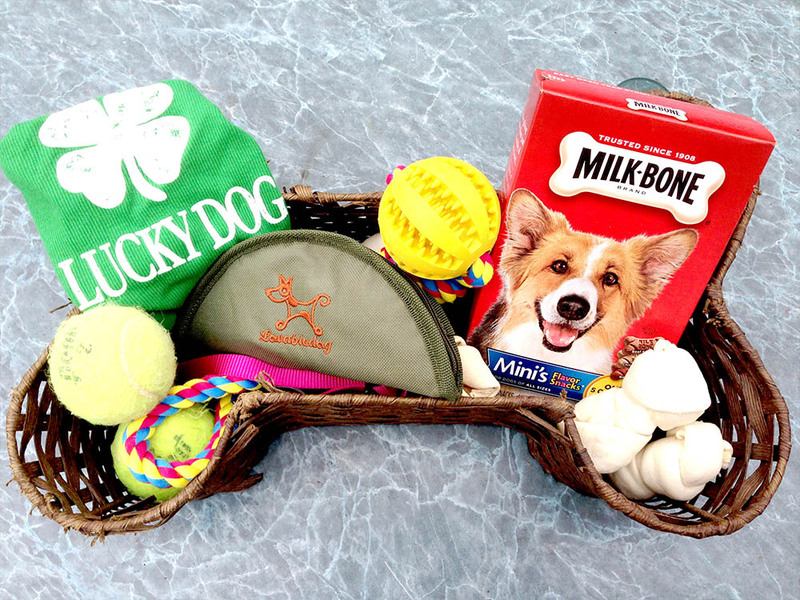 See how you can make an easy themed gift basket for any occasion. These DIY gift baskets are creative and unique, enabling you to give a thoughtful, personal gift. Homemade gift baskets are always such a hit. 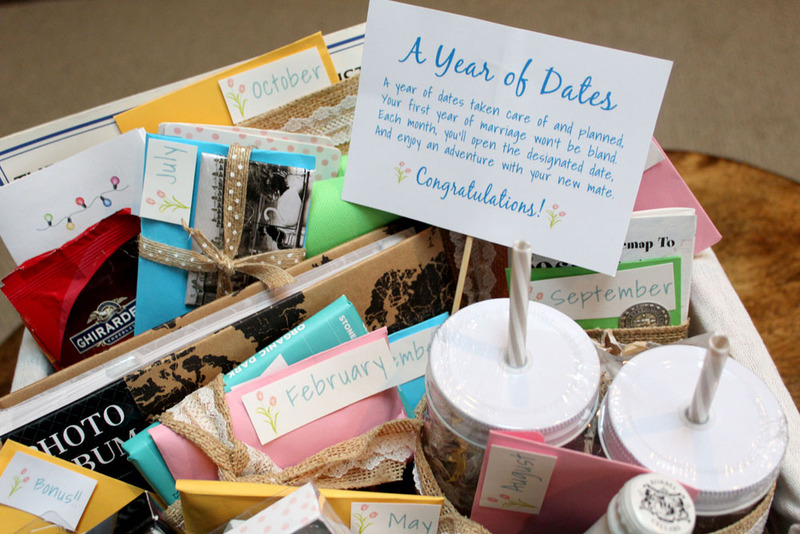 Whether it’s a bridal shower, a housewarming, or a gift for your significant other, people love receiving gift baskets. They are so fun to make – especially when you choose a theme. The fun part of making DIY gift baskets is that you can choose any theme, any budget, and you can be as creative as you want. You can choose items off a registry or you can search places like Target’s dollar spot and the dollar store. You can have a few gifts that are more expensive mixed with a few cheaper gifts. Any way you do it, you are collecting items that go together and making a thoughtful cohesive gift. 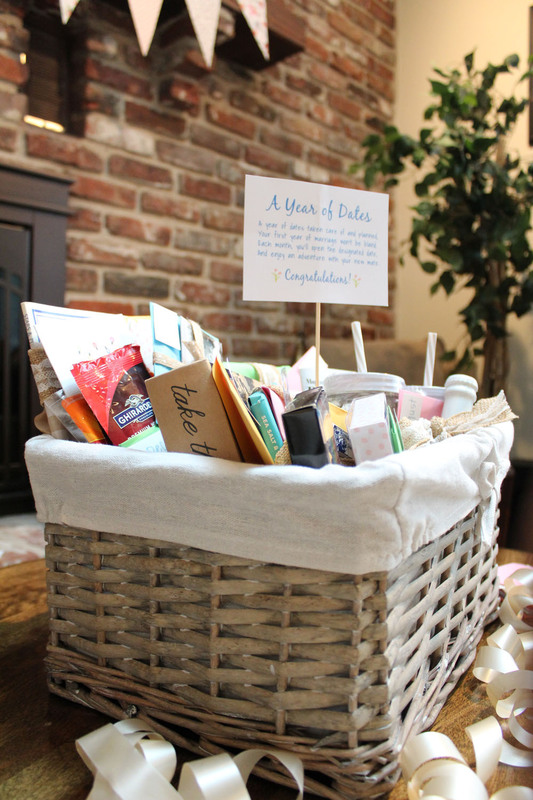 I’ve sat at many showers where the guest of honor is opening registry gift after registry gift. 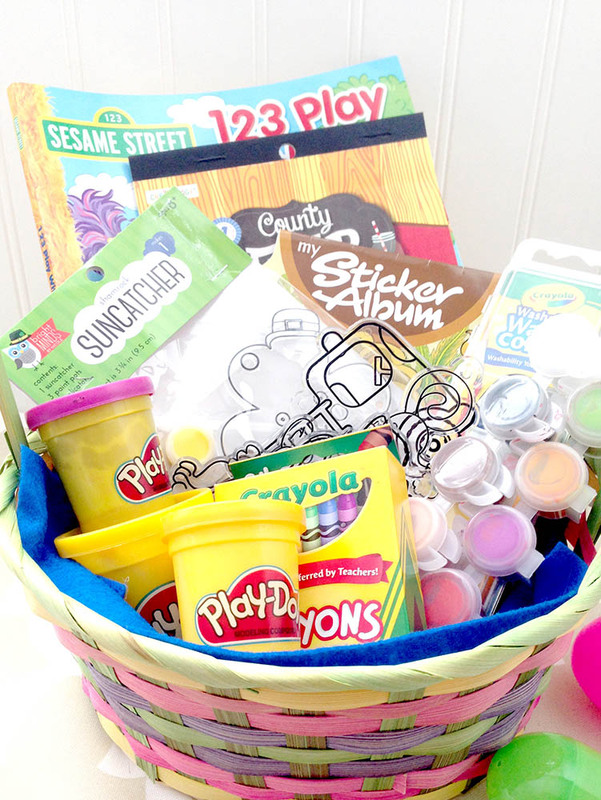 A creative basket is a great way to mix it up! DIY gift baskets always get tons of ooohhs and ahhhhs – plus it shows that you put a little extra thought. Don’t get me wrong – you can still use registry items for your gift basket, but you can definitely do it with a theme. Without further ado, here’s how to make themed gift baskets. If you’re wondering what to fill your homemade gift basket with, the first thing you want to do is pick a theme. If your recipient is registered, you can use this as a starting point if you’d like. For example, if you are shopping for a bridal shower, and she is registered for a pizza stone, you could turn this into a pizza themed gift. You could buy the pizza stone off the registry and add a pizza wheel, a cute cutting board, your favorite pizza dough recipe, gourmet sauce, potholders, seasonings, or wine. A Pizza Night gift basket is a fun spin using a registry item but also using a little creativity to make it a thoughtful gift. If you are trying to cheer someone up, you do a Sunshine gift basket. Sunshine themed baskets usually have items that are all yellow, to cheer up your recipient. If you are making a gift basket for your man or woman, you could do an indoor picnic theme, a year of dates, or a “time to relax” theme. 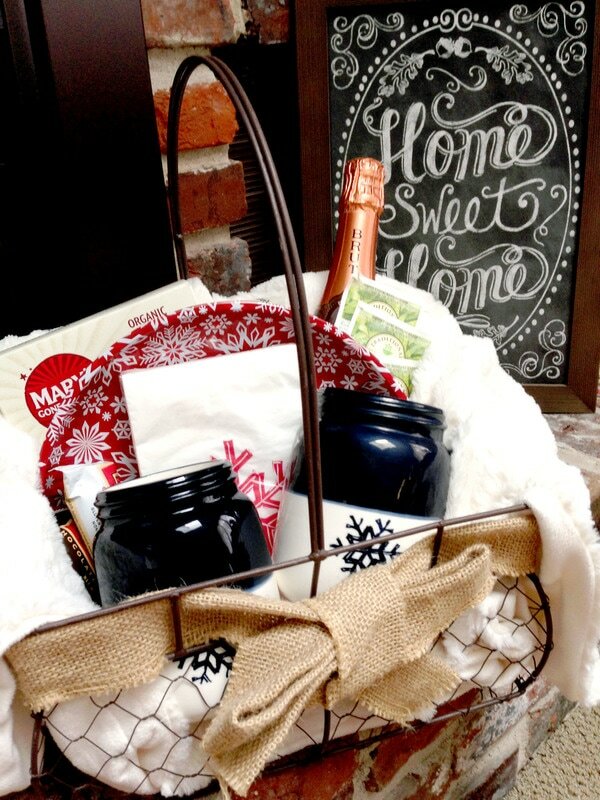 Once you have the theme for your DIY gift basket, you’re ready to start thinking about the gift items. Once you have your theme, you’ll want to start thinking of something that goes with your theme that could serve as the basket or container for your themed gift basket. If your recipient is registered, look through the items on their list for ideas that would suit them. Of course, you can choose a regular basket or container, but it’s always fun when your container goes with your theme. Also, you can save money by using one of the gifts as the container because then you won’t need to spend more money on the basket. 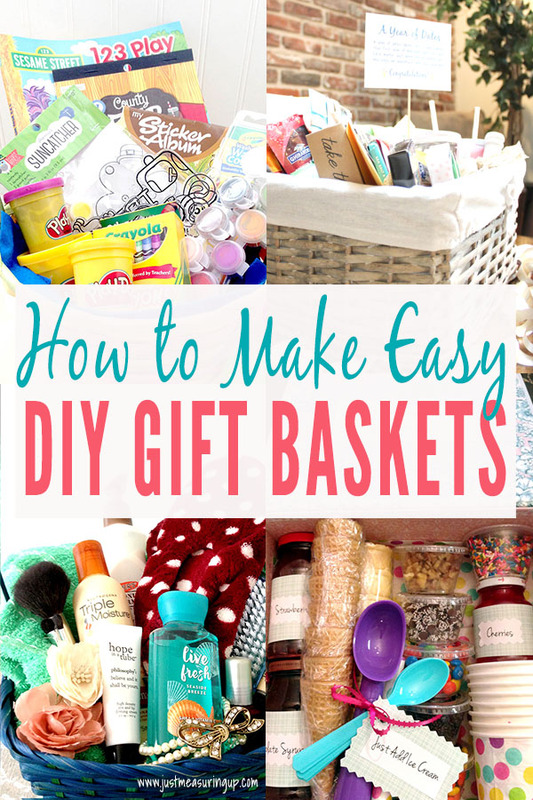 Think about size or weight with your DIY gift basket. You want big enough to fit your items, but not too big where you feel you have to buy more to fill it up. Also, if you are putting something heavy in the gift basket, you’ll want to account for that. For example, if you are making the First Year of Marriage Milestone basket, you’ll need something really strong to hold the 12 bottles of wine. Keep these things in mind as you are choosing the container for your homemade gift basket. For example, for the baking theme, your container could be a cake mold or mixing bowl. If doing a cooking theme, you could use a strainer, crock pot, or an oversized measuring cup. For a get well theme, you could use a big soup bowl. 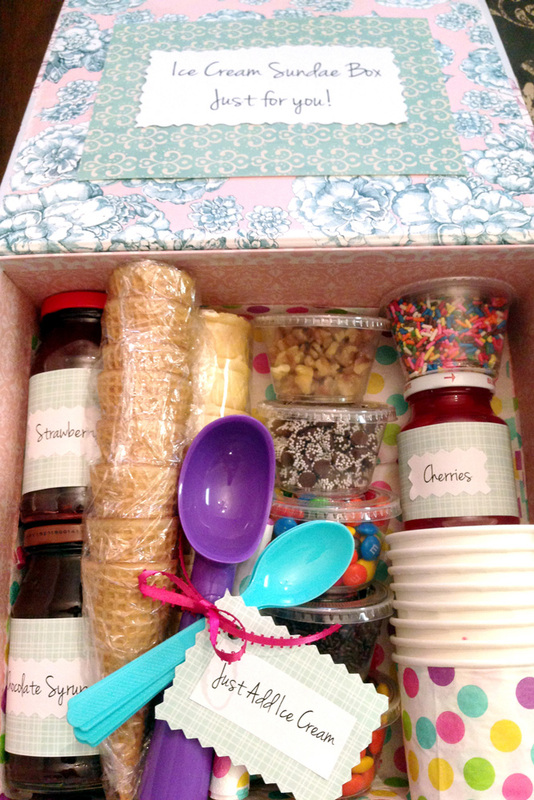 For a college survival kit, you could use a cute storage container. And, for a housewarming, you could use a large pitcher or an oversized jar. If you’re stuck for a container, go to the craft store and a take a look at their baskets. There are so many pretty ones – floral themed, industrial looks. And, you can save money by using a coupon. What do I put in the gift basket? Wondering what to put in a homemade gift basket? Now that you have your theme and your container, now is the fun part. You’ll fill the container with items from the theme. 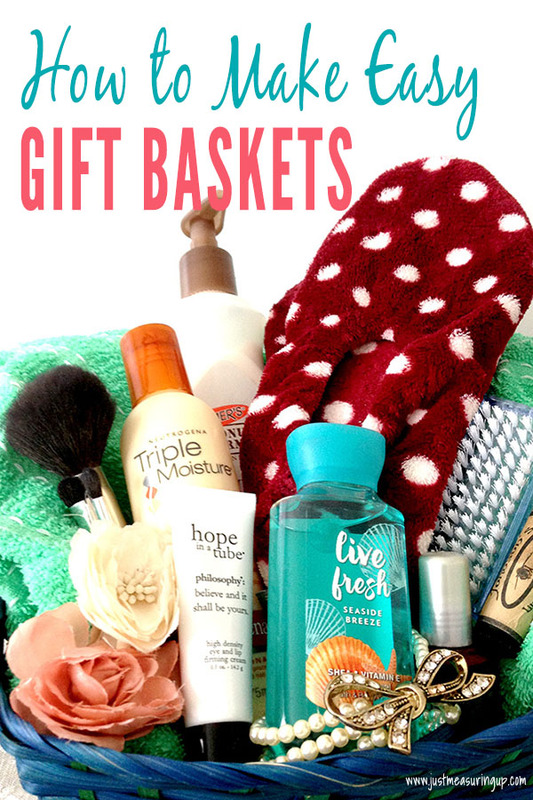 Gift basket items can definitely add up, so you’ll want to make sure that you stay on budget. It definitely helps to create a budget ahead of time. Another idea is to make a list of things that you are looking for, so you don’t buy everything. Definitely use coupons where you can. Try to throw in some low cost items along with some higher cost ones. For example, if you’re making a baking basket, throw in some sprinkles, cupcake wrappers, parchment paper, or cute napkins. 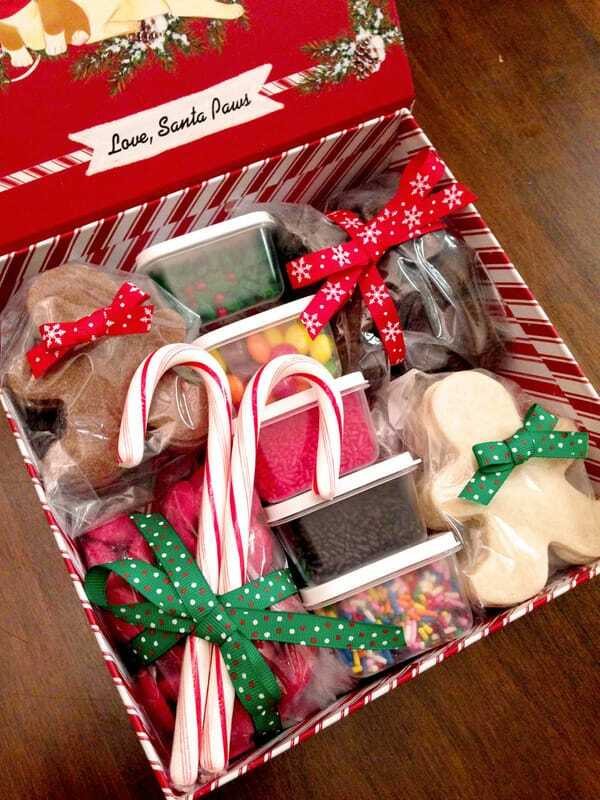 If you are making a holiday basket, you can some candy canes or chocolates.It makes for a fuller basket, and the range of items keeps my price point low. If the recipient has a registry, you can always include any items that fit the theme. Amazon is great for ordering items that are hard to find or that you need quickly. However, there are so many bargains out there. Check out the below list for where to find low cost items. Target’s Dollar Spot – You’ll find all kinds of things here! It’s great to check regularly and pick up things that catch your eye. Dollar Stores – Dollar Tree is by far the best of the dollar stores. 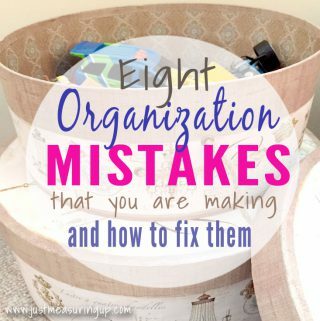 You can get so many things here from cupcake wrappers to ribbons to storage bins (you might find a cheap container here too). 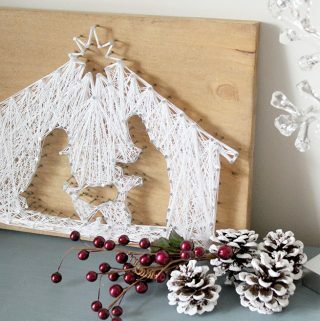 Craft Stores – There clearance sections or dollar sections up front are amazing! Always use a coupon – you can use your phone. Walmart – Lots of low-cost things here – and if you find something on clearance, the price is even better. Check the ends of aisles for random clearance items. Five Below – I was amazed at how much awesome stuff this store has – especially around the holidays. Books, socks, toys, college dorm things, and all kinds of seasonal things too! Christmas Tree Shops – I love this store SO much. It’s a cross between a Dollar Tree and a Bed, Bath, and Beyond. Lots of seasonal things, kitchen items, books, decor – they have it all. As your shopping for your items, think about whether your basket need a filler or not. You can use tissue paper, you can use shredded paper (you can get this at the dollar store or I’ve even made my own). But my favorite thing to do is to use something from the theme for the basket filler. For a holiday basket, you can use garland. For an indoor picnic basket, you can use a cozy blanket. And, for any kitchen, coffee/tea, or bridal baskets, you can use cloth napkins, which are always on clearance at some of the above stores. Shredded paper – Buy or shred your own! I’ve done this to make a unique color – it takes a lot of paper, but it works like a charm. Small cardboard box – Perfect if your basket is too big. You can even hide an extra gift in it! Table cloth – If you’re making a craft basket for kids, use a few plastic tablecloths as the filler for easy cleanup with their art activities. Scarf or t-shirt – If you’re making a gift basket for a new college student, the basket liner could be a t-shirt or sweatshirt with their college name. Craft materials (felt, knitting, etc) – For a crafty basket, you could use felt or another craft material to the line the basket. For a baby basket, you could line the basket with your knitted gift. How do I assemble the gift basket? Once you have your container, your items, and your filler, you’ll want to start assembling your DIY gift basket. 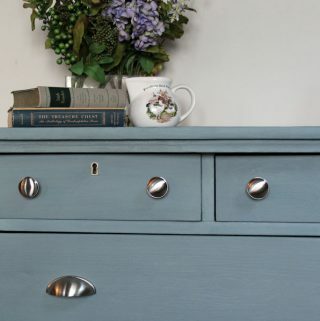 When you are arranging your items, you’ll want to arrange them in a way that showcases them all. Start with the larger items and put them in the back. Work your way down to the smaller items, which you can easily fill in the front. Tilt things at an angle to bring intrigue and showcase more. You can tuck away any of the less exciting items, and put the more exciting ones in a more visible spot. When I was arranging my sister’s Year of Dates gift basket, I had a hard time making everything look nice. There were 12 separate items, each with envelopes, and it was difficult to make it look elegant. 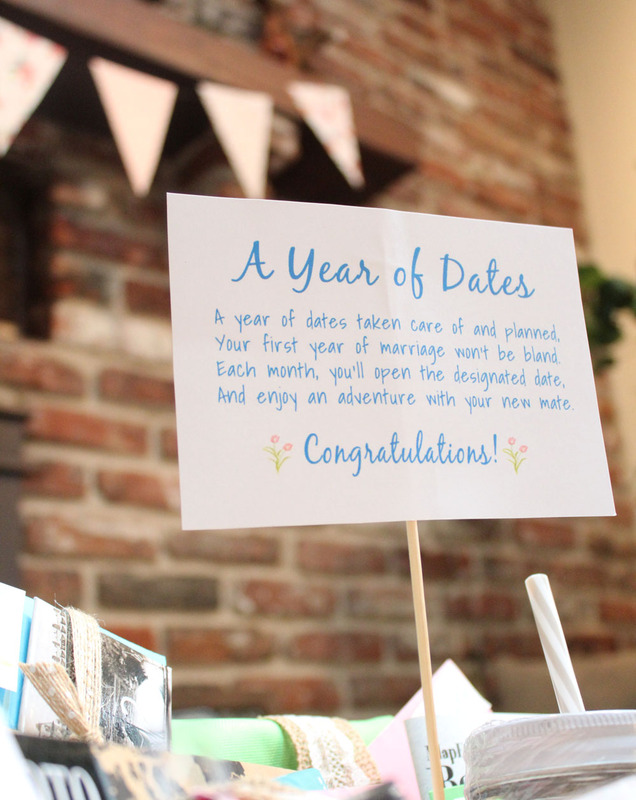 I ended up tying a piece of ribbon around the items that went together (for each date), along with the envelope. It brought some cohesion and elegance to the gift, rather than just looking like I threw a bunch of items in a basket. 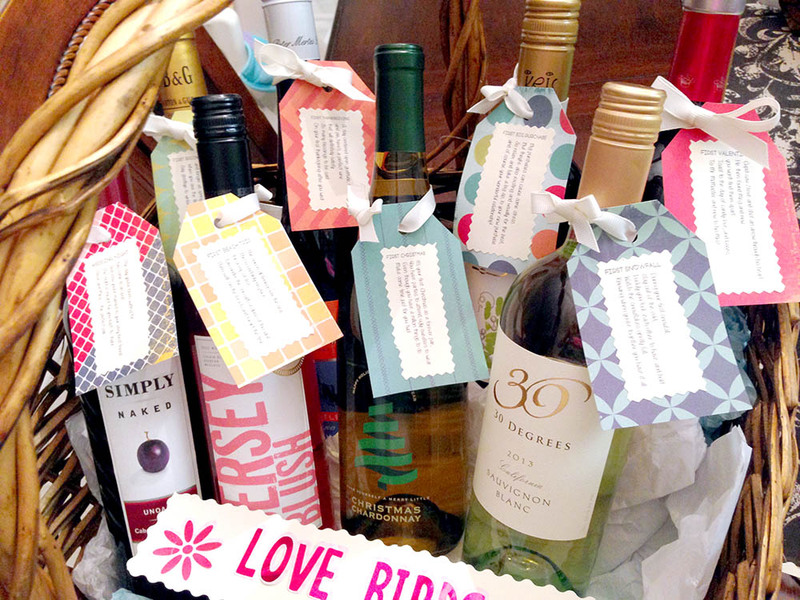 Once you have your DIY gift basket arranged nicely, you can add a cute gift tag. You use a little piece of card stock and print or write on it – and then attach with a nice ribbon. If it’s not obvious what your basket is, definitely write it on the tag (Pizza Night Gift Basket, Little Artists Basket, etc). You can even come up with a sweet rhyme. For my gift tags, I usually just print them on Microsoft Word. Sometimes, I print on card stock and cut that out. Sometimes, I just print on regular paper and glue to card stock. One thing I love to use is squiggly scissors. I seriously cannot cut a straight line, so the squiggly scissors not only hide my imperfections but they add a bit of fun to the tag. If you want your tag displayed more, then you could attach it to a wooden skewer and then stick it right into your basket like a candle on a cake. If you want, you can add a clear gift basket bag, cellophane, or even tulle over your basket. In my opinion, the easiest and cheapest way to hold it together is definitely with a clear gift basket bag. You can get these at the Dollar Store (usually 2 for $1). With the gift bag, you don’t have to worry about trying to wrap the basket up – you just slip it into the bag 🙂 Make sure to check the size on the bag to make sure if will fit your container. You can always slide the basket in sideways and tie in the back. With my gift baskets, I typically don’t wrap them up at all because I think it takes away from how nice the basket looks. However, if you are travelling or are worried that something will fall out, then definitely buy one. You don’t want to lose any items after all your hard work. You can also use a box and then no extra wrapping is necessary. No matter what kind of themed gift basket you are making, I’m sure your recipient will absolutely love the hard work and thought you put into it. Anyone can buy a couple gifts at the store, but to make a DIY gift basket with a special theme is next level. 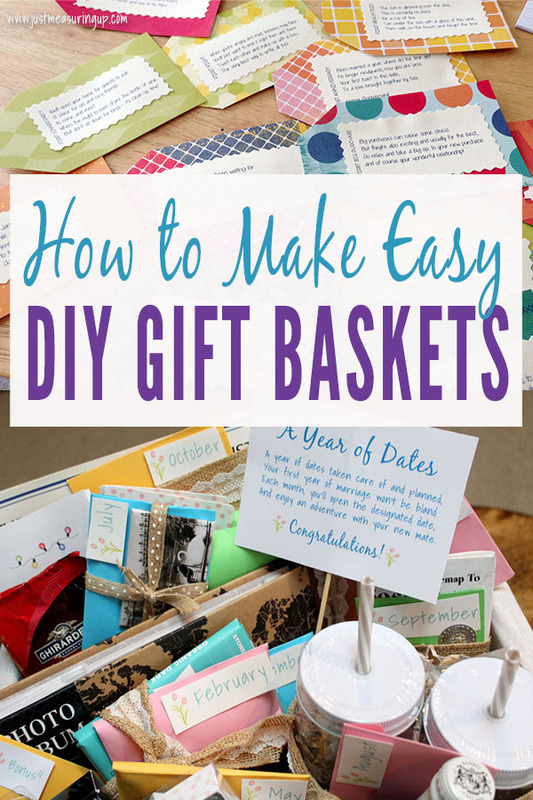 Whether it’s a wedding gift basket, an encouragement gift basket, or a family gift basket, I hope this helped you with creative ideas for your DIY gift basket.